Where there’s water there’s life! Could this be true or a misleading statement when it comes to Mars? For years now scientists have been scouring the red, dusty ground of this planet in search of water (or at least the evidence of H2O) and it appears the journey may not have been in vain. New images sent back from the probe are showing Mars may not be as parched and arid as we once thought. As early as the 1970’s researchers suspected Mars may have (or at least once had) some form of water either on the planet itself or in its atmosphere. With the help of probes and orbiters, we have since learned there is a very real possibility that Mars could be holding water, but where is it exactly and is it enough to sustain life? Stunning pictures reveal liquid water has run down canyons and crater walls over the summer months, leaving behind long dark, trickle stains as evidence. These marks are reaching hundreds of meters downhill before the planet’s season changes and its temperatures drop. The most heavily and active spots are showing intricate fan-like patterns that suggest water may have been present at some point. Although, scientists are not one hundred percent positive where the liquid is stemming from, they suggest it could be from underground ice, salty aquifers or even condensed from the planet’s atmosphere. “Liquid water has been found on Mars,” says Jim Green from NASA. From the earlier missions of the Curiosity Rover, Mars revealed itself to have a “watery” past. Pictures sent back to Earth showed dried-up rivers and plains that were once submerged beneath a vast expanse of lakes. In addition, NASA was also able to uncover information that suggests this dusty planet may have once had an ocean that could have covered half of its Northern hemisphere. Researchers theorize that Mars could once have been like Earth and had fresh water seas, lakes and even snow-capped mountain regions. However, this Earth-like water-cycle was most likely disrupted due to an extreme climate change which caused it to lose its surface water. Researchers are just starting to tap into the vast mystery of water on Mars with more questions to be answered. 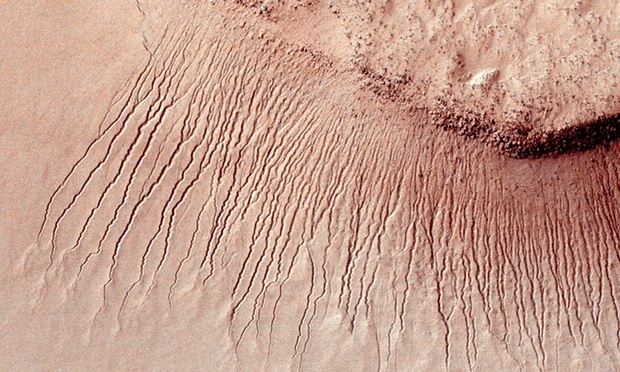 In 2011, Scientists were excited to discover what looked like “little streams flowing down crater walls” occurring from late spring to early fall on the Martian planet. They called them “recurring slope lineae” (RSL). It revealed this RSL had the presence of hydrated salts (a mixture of chlorates and perchlorates) which all points to water in the four sites that were inspected; a large canyon called, Coprates Chasma, Palikir, the Hale and also the Horowitz craters. Interestingly enough these flows only appear when the surface-temperature of Mars reaches above -23 degrees Celsius (-9.4 degrees Fahrenheit). Although this may sound implausible here on Earth, the salt content in the Martian water lowers its freezing point, allowing it to stay in a liquid form. Lead scientist on NASA’s Mars exploration programme, Michael Meyer, believes this substance very well could be water mixed with the perchlorates to form a brine.